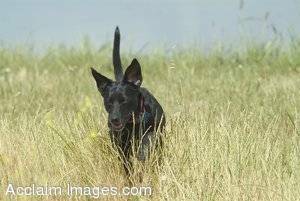 Description: Stock photo of a black dog, Sara, a lab-terrier mix. Sara is part of the Southern Oregon Squirrel abatement program. This picture has sara running through the tall grass.